Scientific God Journal 3(6) celebrates the discovery of Higgs Boson (or Higgs-like particle). Congratulations to CERN, Fermilab, people at LHC, people at Tevatron and all the theoretical and experimental physicists who made this discovery possible over the last 50 years! In the meantime, let us all contemplate what this discovery means and what it has to do with scientific studies of God and be cautious about the new discovery since there are still unsettling issues. After introductions of articles in this issue, we shall focus our attentions on some of the phobic, allergic or even hostile but important issues related to the new discovery. The topics covered includes: Antidote to 20th Century phobia; “higgson” as the name of the new particle; quantum gravity & table top experiments; higgson as the shadow of universal consciousness; and the 2012 phenomena & Dawn of a Brave New World. This Editorial ends with a “mathematical” poem entitled “The Real ‘God Particle’ Please Stand Up.". 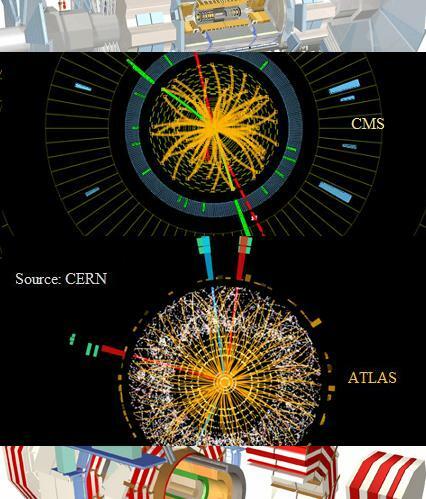 This was a live Higgs report from the webcast of CERN Announcement on July 4, 2012 plus viXra unofficial Higgs combinations and my analysis after the announcement. As expected, CERN has happily announced the arrival of a new Boson. The facts are that the boson discovered with a mass of about 125 GeV or 126 GeV interacts with a wide range of particles in exactly the way the Higgs boson should. Its decay modes to Z, W, b and tau have just the right ratios and its production has also been tested in different ways confirming indirectly that its coupling to the top quark is also about right. Its spin could be 0 or 2 but 0 is much more likely. All these features point to the standard model Higgs boson. The only fly in the ointment is its decay rate to two photons. This is nearly twice as large as expected. The significance of the discrepancy with the standard model is about 2.5 sigma. Three weeks after announcement of discovery of Higgs particle at LHC we discuss this discovery from the point of view presented previously in (1) in the form of predictions, and from what we had argued before in (2-5). We argue that behind Standard Model there might be another level of discernible reality which we call reference of life (4). We show how we can connect it with the vision in the general sense and vita principalis and how it could be connected with what we discover as mathematics (3). We argue that mathematics is a form of creatio ex nihilo but only in its weak form where the proper agent is the vision or vita principalis.